Before soon, everyone would have resumed business as usual after enjoying a short stint with tranquility and reflection. I hope. Today is Easter, the link between Lenten rest and at least another nine months of exhaustive work. We should all enjoy Easter and be happy for it. 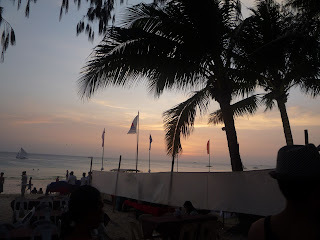 If it were really traquility that the soul longed for during Holy Week, I wondered why we had to escape what was the quiet City for popular and frenetic vacation spots like Boracay which was once more populated with (you guessed it) acquaintances and familiar faces. What was it about showing up in social places like that as similar as wanting to be seen in popular parties? What was it about strutting half-naked not just on the beach but even in eateries and stores proudly showing off a body that's the product of three months' hard labor. Flying to Bora was not as simple either this time. We had to suffer through an almost two-hour trip from Kalibo to Caticlan. Blame that on the January/February flight cancellations of most airlines to Caticlan when bookings were placed. Why should one endure the wasted time and the boredom of the land trip? Why as well enjoy way below five-star hotel facilities? Can we really sustain ourselves with that? It might not be the tranquility but the change of scene and of daily routine (and certainly the incomparable silky white sand of Bora), I have come to conclude upon arriving in Manila last night because despite the heat and tired bodies, we still felt energized to face another day and week of fruitful consequences. just wanted to make sure you know about this book: Click! Thanks for dropping by and for the recomm. Was in fact planning to purchase. Indeed, BELIEVE! it's a great "what if?" adventure of Wendy choosing another path: Click! Do you have a blog that I can follow?